Israeli soldiers abducted, Thursday, at least six Palestinians, including two former political prisoners, in several parts of the occupied West Bank, the Palestinian Prisoners’ Society (PPS) has reported. The PPS said that the soldiers invaded and ransacked many homes at dawn, in the Ramallah and al-Biereh Governorate, in central West Bank, and abducted Nasr Mohannad Hamayel, Hazem Abdullah Ladadweh and Ja’far Mahmoud B’eirat. 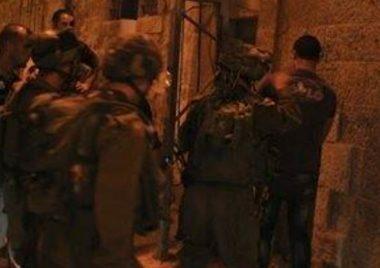 The soldier also abducted a former political prisoner, identified as Ameer Salama, from Nablus, in northern West Bank. In Qalqilia, also in northern West Bank, the soldiers abducted Issa Amer, a former political prisoner who previous spent eleven years in Israeli prisons. Furthermore, the soldiers abducted a Palestinian Shepherd, identified as Sati Daraghma, in the Sweida area in the West Bank’s Northern Plains. It is worth mentioning that the army frequently abducts shepherds in that area, and refused to release them unless their pay high fines. The Prisoner Support and Human Rights Association (Addameer) has reported that Israeli is holding at least 5.580 Palestinian political prisoners, including dozens of children.